The lower right side of Amtrak Locomotive 627's front end was crushed rearward and upward in the deadly Chester accident. An investigation into the Amtrak crash that left two people dead in Chester last April revealed that the engineer operating the train tested positive for both marijuana and opioids, according to a report released Thursday by the National Transportation Safety Board. The early morning crash on April 3 occurred in clear weather conditions when the locomotive, engineered by 47-year-old Alex Hunter, slammed into a backhoe on the tracks, killing veteran Amtrak employees Joe Carter and his supervisor, Peter Adamovich. There were 341 passengers and seven crew members aboard the train traveling from New York City to Savannah, Georgia. Among them, 35 were transported to local hospitals with non-life-threatening injuries. 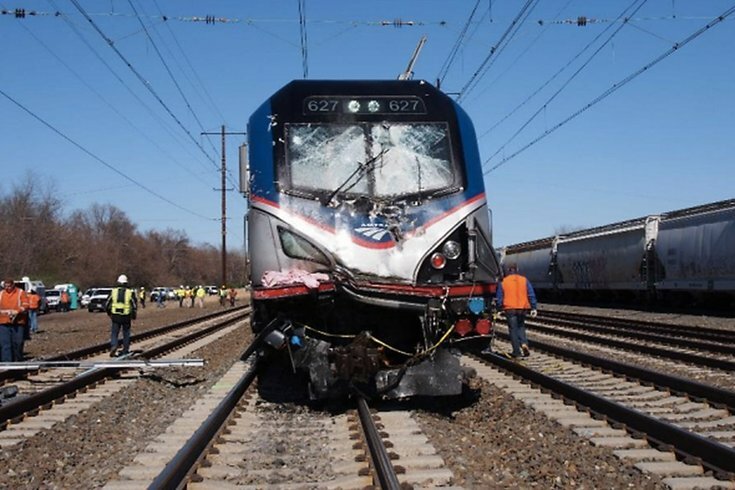 At the time of the crash, Train 89 was moving at 106 mph — within the track speed of 110 mph — but by the time the engineer applied the emergency brake, it was on a collision course with the backhoe and the two Amtrak workers manning it. Six seconds prior to the impact, Hunter began sounding his horn and then laid flat on the floor of the locomotive. He noted at the time of the crash that the locomotive had lifted off the tracks, though none of the passenger cars had come off the rail. As required by federal regulations, all members of the Amtrak crew provided blood and urine specimens for post-accident toxicological testing. Results for the conductor, assistant conductors and dispatchers were all negative, but Hunter's samples returned positive results for cannabinoids and opioids, according to the NTSB report. Interviews with Amtrak's foremen responsible for notifying train crews of track closures and maintenance work indicate that a miscommunication between the night and day foremen resulted in Train 89's failure to take note of the backhoe stationed on Track 3 where the accident occurred. At the time of the incident, work was underway on Track 2, however, there was also supposed to have been "foul time" — safety closures that signal trains should be rerouted — on Tracks 1, 3 and 4 as well. Hunter's training and background as an engineer did not appear to present any abnormalities outside the positive blood and urine samples. Investigators believe one of the primary causes of the crash was a miscommunication of assignments during a handover of shifts.